Nikon ProStaff 3-9x40 Riflescope Review - Truly A Great Scope? →Nikon ProStaff 3-9×40 Riflescope Review – Truly A Great Scope? The Nikon Prostaff 3-9×40 Riflescope is an excellent scope for all types of hunting. It is easy to mount and return to zero functionality and has superb clarity thanks to its multicoated lens. It is built to last and allows for the best in long range shooting. Its 3.6 inch eye relief also makes it very comfortable for users. The Nikon Prostaff Riflescope presents quite a large array of features that all hunters will appreciate. These features set it far ahead of most other riflescopes of its class. 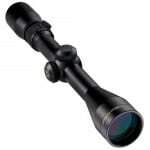 The Prostaff Riflescope can be utilized for all styles of leisure and professional hunting. The Riflescope packs enough power for very long range shots and is equipped with a wide field of view. This allows the hunter to clearly see through any wild brush or timber. The scope has a 3-9 actual magnification by 40 millimeter effective objective diameter. This allows for effective center fire when using your rifle to hunt both big game and tiny varmints. Top of the range performance lenses specially coated with numerous layers of compounds that prevent reflection while enhancing light transmission to the viewer’s eye. This also serves the same purpose of improving the contrast and true color rendition. The riflescope is encased in a totally water and fog-proof shell with an o-ring sealing. This is then filled with nitrogen to make sure that moisture can never get into the casing. The scope comes with a limited lifetime guarantee from the manufacturer. The Nikon Prostaff riflescopes come with 3x to 9x actual magnification capabilities. This allows you to spot varmints that are a long range away or big game that is just a few hundred steps from you. The field of view on the riflescope is quite wide making it pretty easy for you to see through the obstructive thick brush in the wild or timber in the forest. The resolution of the Nikon ProStaff is way ahead of its league. It has a multi-coated lens that makes sure you have at least 80% light transmission. It also comes with a Bullet Drop Compensating reticle (BDC) that allows for very easy holdovers when shooting up to a range of 600 yards if you have a magnum caliber. The Nikon Prostaff riflescope has an impressive 40 millimeter effective objective lens diameter. This is quite impressive due to the fact that the large diameter allows more light to get into the lens thus letting you have a clearer and brighter image of your target. The Nikon Prostaff Riflescopes all have a 3.6 inch eye relief. This is important because you need a riflescope that can allow you to hold the scope at a comfortable distance away from your eye and still get a clear field of view of your target. The 3.6 inch eye relief is more than enough for any level of skilled hunting. The Nikon Prostaff Riflescopes present only the best in optical lens coatings. They have a multi-coated lens that will allow for up to 90% light to be transmitted into the lens. These multiple layers of coatings are all made from various anti-reflective compounds so you do not have to worry about your riflescope reflecting lights onto your targets. The compounds found in the coatings will also enhance the contrast between your game and the environment that they are in allowing you to paint a precise bull’s-eye on your target. The light transmission is highly boosted and the coating compounds also allow for the delivery of true color rendition. To enhance the viewing experience even further, the lenses are flare free thanks to the same multi-layered coating thus giving you a sharp clear image quality. The Prostaff scope is manufactured with a 100% water-proof and fog-proof casing. It is then filled in with nitrogen and sealed with a high quality O-ring sealing to make sure that you will never have to worry about any moisture getting into the interior of your riflescope. This means that if you take care of your Prostaff scope, you can get years if not decades of service out of it. For just a few extra bucks, you can get the AccuShot Premium 1-Inch Weaver Style See-Thru High-Pro Rings. This will only set you back about $10 but will enhance your shooting capabilities by letting you to firmly mount your rifle in place. It comes with a full length locking plate so you can be sure that its installation is very easy and quick for any hunter. It is very secure holding your rifle in place with easy to use hex screws that come with various retention features. It is made from aircraft-grade aluminum alloy so you can be sure that it will give you years of service as well. One of the biggest pros that you will get from the Prostaff scope is that it is one of the easiest scopes to setup and then when done return to zero functionality. It also has one of the only BDC reticles that actually works. On the cons side, the only thing noticeable is that one has to take a while before they can quickly adjust the magnification while on the hunt. The Nikon Prostaff Riflescope is currently rated 4.9 out of 5 stars on Amazon. Below are just a couple of the customer reviews. Click here to find current pricing and more information on the Nikon ProStaff 3-9×40 Riflescope . Check out our other rifle scope reviews if you want more in-depth analysis of different hunting scopes.